After recent outbreaks of the measles virus in WA and OR, health officials are reminding people how to protect yourself and your family from this highly contagious virus. BAKERSFIELD, Calif. — Concerns about measles outbreaks are sweeping the Pacific Northwest after dozens of cases have been identified in Washington and Oregon. Almost two weeks ago, Washington State declared a state of emergency in response to the measles outbreak. According to the Oregon Health Authority, some of the cases in Oregon have been linked to the outbreak in Washington. "Unfortunately I have to say that a majority of these cases are from people who chose not to vaccinate and we are seeing the effects of that," said Dr. Fernando Fan, Chief Pediatrician at Kaiser Permanente. 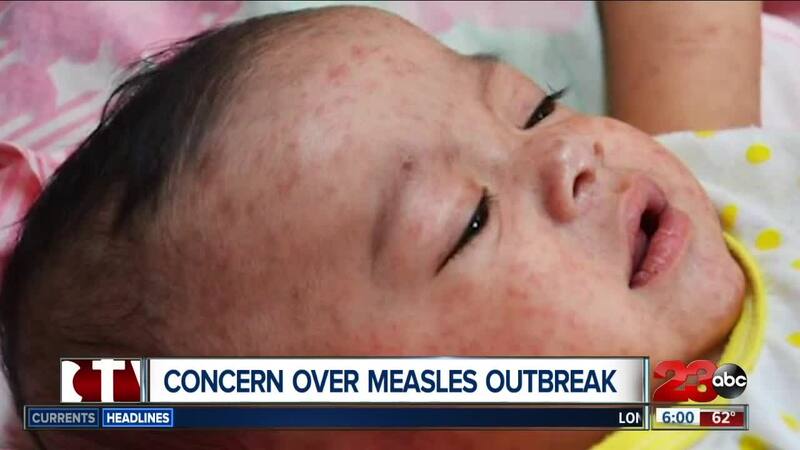 The Kern County Public Health Department released a statement, "We are always concerned about measles. Measles is highly infectious. 90% of people who are not immune to measles will become infected if exposed to it. Infected people can spread measles up to four days before they ever start having symptoms. However, vaccination again measles is very effective at preventing illness. Here in Kern County, we tend to have good vaccination rates, so many of our residents are immune and cannot catch measles. Our biggest concern is for those who cannot be vaccinated such as infants under one year of age and immune-compromised individuals like those on chemotherapy." Measles is a highly contagious virus and can cause permanent brain damage and in some cases can be fatal. The virus can spread through the air and by touch. If someone breathes in contaminated air or touches an infected surface then their eyes, nose or mouth they could become infected. According to the Center for Disease Control, the measles virus can live for up to two hours in an airspace where the infected person coughed or sneezed. The CDC said symptoms include a runny nose, fever, cough, pink eye along with tiny white spots inside the mouth and a rash that develops from head to toe. "If you get one dose at 12-months of age and you get one dose at 4-years of age, that should confirm lifetime immunity," said Dr. Fan. "CDC recommends children get two doses of MMR vaccine, starting with the first dose at 12 through 15 months of age, and the second dose at 4 through 6 years of age. Teens and adults should also be up to date on their MMR vaccination," according to the CDC website. Dr. Fan said if your child is younger 12-months and your traveling to an area where measles has been identified, you can talk to your doctor about a preventative shot that may help protect your child. Although that shot would not count for the two recommended vaccines, according to Dr. Fan. If you think you or your child is exposed to measles doctors urge patients to call ahead before showing up to a clinic or the ER, because it would put other patients at risk. There are certain procedures in place for taking care of patients with measles.